Armenian Prime Minister Serzh Sargsyan stepped down on April 23 after thousands of people took to the streets to protest his rule. What sparked this public outrage and how is Russia viewing this political change? Serzh Sargsyan, who ruled Armenia for 10 years, tendered his resignation after widespread public demonstrations against his attempts to hold onto power. The Armenian government named former Prime Minister Karen Karapetian, an ally of Sargsyan, as acting premier. The protests were sparked by Sargsyan's move to extend his rule. The 63-year-old was president of Armenia from 2008 until a term limit forced him out in March. But the parliament, which is controlled by ruling Republican Party, installed him as prime minister in April and curbed the powers of the president. The shift to a strengthened parliamentary triggered massive anti-government protests in the capital of Yerevan on April 13, with thousands of people participating in rolling demonstrations against Sargsyan. Hundreds of Armenian soldiers also joined the protests. The parliament's move to keep Sargsyan in power echoed a maneuver by Russian President Vladimir Putin a decade ago. Leaders in several former Soviet republics have used similar methods to remain in power. Acting PM Karapetian too has close ties with Russia. He worked in Russia for five years as a senior executive of state-controlled gas giant Gazprom. Protesters in the capital Yerevan took to the streets to celebrate Sargsyan's resignation. A day after Sargsyan stepped down, the country's opposition called for a meeting with the caretaker prime minister to discuss a "peaceful transfer of power." In this photo, opposition leader Nikol Pashinian (R) is seen in a meeting with Sargsyan on April 22, urging him to step down. Russia, Armenia's closest ally, said on April 24 that it was not concerned about the political situation in Yerevan. Kremlin spokesman Dmitry Peskov said he did not regard Armenia's political tumult as a Ukraine-style revolt against pro-Russia politicians. However, according to analysts, Sargsyan's resignation has unsettled Russian interests in Armenia. After talks with acting Prime Minister Karen Karapetyan were cancelled, Pashinian and his supporters took to the streets again on April 25 to demand parliament choose a "people's candidate" who di not come from the ruling Republican Party. Armenia's parliament will vote for a new premier on May 1. Pashinian has said he is prepared to be a candidate, but it is unclear if he will get support. The ruling Republican Party holds a majority in parliament. 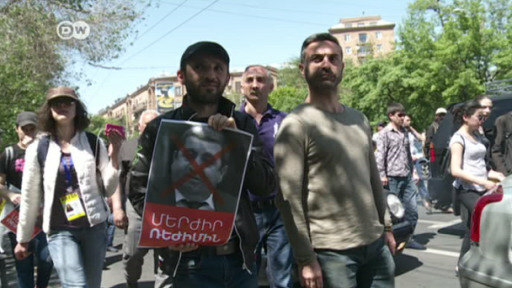 As Nikol Pashinian's supporters staged further protests on April 29, the ruling Republican Party which holds a majority in parliament said it would not put forward a candidate for prime minister to stand against Pashinian. The party would not "impede the election of the people's candidate" if all three opposition factions voted for him, leader Vahram Baghdasaryan said. Short of six votes, Pashinian met with other political leaders in parliament on April 30. "We are facing the task of resolving the political crisis in the country," he said. "If a prime minister is not elected tomorrow, this crisis will not disappear." The vote in parliament for a new prime minister was scheduled for May 1. Street protests have forced the resignation of Armenian Prime Minister Serzh Sargsyan just days after he took up the post. The rapid turn of events could shake up Russia's interests in the region. 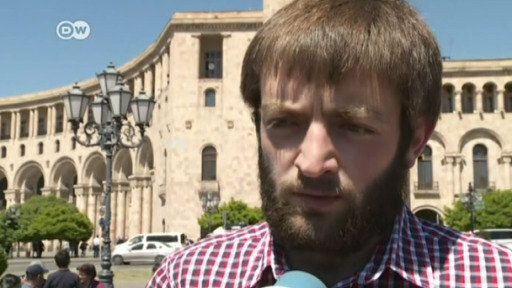 Opposition leader Nikol Pashinian said he will meet the president-turned-premier to discuss "his resignation." But hours before the announcement, Sargsyan said no one but he himself could navigate Armenia's issues. Just last May Armenia celebrated the "world's merriest apocalypse." Now the country is holding the first elections since its "Velvet Revolution." Felix Franz reports from Yerevan. 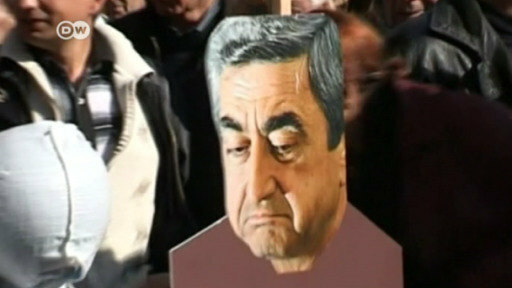 The move follows days of protests against Sargsyan, whom protesters accuse of clinging to power. Earlier on Monday, opposition leader Nikol Pashinian, who was detained for his role in the protests, was released.